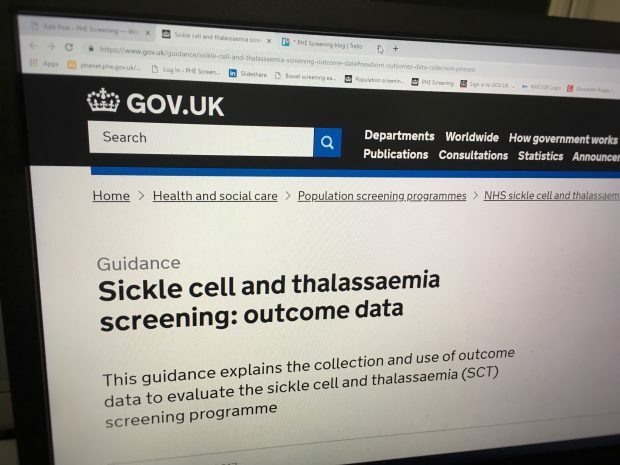 We have been collecting newborn outcome data for the NHS Sickle Cell and Thalassaemia (SCT) Screening Programme since 2010. Most newborn babies are tested and screening accurately identifies those with sickle cell disease (SCD). However, an evaluation of 5 years of the newborn screening programme confirmed that one out of five (20%) of infants with SCD are not enrolled into specialist care or receiving penicillin by the recommended standard of 3 months of age. There is therefore a risk that babies might get ‘lost’ in the system as they move from newborn screening into care. The system provides oversight of the baby during the hand-over from screening to specialist care and gives laboratory staff and clinicians up to date information so babies’ treatment can start as early as possible. In December, we started to use the system for real in parallel with existing processes. We are inviting more people to use it until the system is implemented in every newborn screening laboratory, specialist nursing centre and hospital that provides treatment for babies with SCD or thalassaemia. Professor David Rees, a consultant paediatrician and clinical adviser to the NHS SCT Screening Programme and Sickle Cell Society, is calling on paediatricians and haematologists to implement the system in their area. SCT network leads have an important role to play in making sure this happens. The new system should make it much easier for babies to be referred into clinics and for all the routine data to be collected. It should be significantly less work for laboratory and clinical staff, and ensure that data collection is complete to allow outcomes to be monitored. If you are involved with this part of the SCT screening pathway we will be contacting you soon, or you can contact us via the Screening Helpdesk. We will continue to give updates via the PHE Screening blog.